New world order in the auto business. 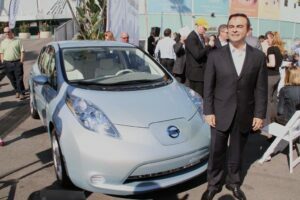 Nissan CEO Carlos Ghosn with a prototype Nissan Leaf. In a stunning upset, Nissan Motor Co. surged past rival Honda Motor Co. to become the second-largest Japanese automaker – and join the Top Five car manufacturers worldwide. The switch in status was driven, to a significant degree, by Nissan’s success in tapping the emerging Chinese automotive market. Nissan sales there surged by 36% in 2010, and at 1.02 million units, sales in China accounted for a full 25% of the Japanese maker’s global 4.08 million total. Worldwide, Nissan saw a 22% increase in volume, last year, compared to 5% for Honda, which reported global volume of 3.56 million. However, the two makers combined still fell short of the 8.42 million cars, trucks and crossovers sold by the world’s automotive leader, Toyota, and its various subsidiaries. General Motors came in a very close second, well ahead of the world’s third-largest automotive manufacturer, Germany’s Volkswagen AG. However, if Nissan’s numbers were paired with its global alliance partner, Renault, sales jump to 7.28 million, more in line with Volkswagen. The industry’s pecking order, long stable, has been proving surprisingly volatile, in recent years. Toyota’s push past GM, three years ago, marked the first time the American giant slipped from its perch as king-of-the-automotive-hill in 75 years. But Volkswagen has thrown down the gauntlet and is targeting global leadership by 2018, if not sooner. Others also have their sites set on market supremacy, notably including Korea’s Hyundai and Kia, as well as Italian-based automaker Fiat, which could soon expand its stake in America’s Chrysler to 51%. Fiat/Chrysler CEO Sergio Marchionne has said it is essential in the current market to sell at least 4 million vehicles annually, worldwide, in order to be successful. But during an interview at the Detroit Auto Show, earlier this month, the Canadian-educated executive said he may need revise that figure upward to at least 5 million. As for Nissan, the maker is intent on pushing up volumes with an array of 10 new models it plans to launch this year. That includes the new Leaf battery-electric vehicle. While the Japanese maker plans a slow roll-out of the technology, it expects to be producing 250,000 battery cars annually by mid-decade, or 550,000 if one includes the models that Renault also has on tap. While Leaf is a low-volume offering, Nissan is counting on using its halo to improve its standings in the U.S., where Honda has long dominated. But Honda is fighting back on a variety of fronts. It is pushing hard to build demand in emerging markets, such as China. And it recently announced that it will expand its narrow line of conventional hybrids to include both plug-in models, as well as full battery-electric offerings aimed at the Leaf. This entry was posted on Friday, January 28th, 2011 at and is filed under Automobiles. You can follow any responses to this entry through the RSS 2.0 feed. Both comments and pings are currently closed.